At the age of 13, R. H. Barlow became pen pals with H. P. Lovecraft and Robert E. Howard, often publishing their stories and poetry under his Dragon-Fly Press imprint. 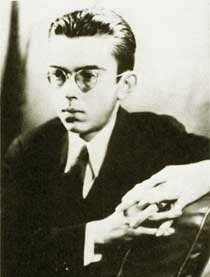 Lovecraft left Rhode Island for two consecutive summers to visit the teenager in DeLand, Florida and assist him with his burgeoning fiction career. They collaborated on six stories together, and on Lovecraft's passing, Barlow was named his literary executor. Barlow went on to publish some further weird fiction and volumes of poetry, later moving to Mexico City where he made a name for himself as an anthropologist and translator of the Nahuatl language. As a professor at Mexico City College, William S. Burroughs was one of the students Barlow introduced to the mysteries of the Mayan codices. In 1950, Barlow published a short run of one of the only Nahuatl newspapers ever printed, Mexihkatl itonalama. At the time of his death, he was widely recognized as the authority on 14th to 17th century Mexico. Barlow committed suicide by barbiturate overdose amid a boy-love scandal at the age of 32.